American labor unions are increasingly critical of President Donald Trump’s tariffs on imported products like steel from China. A growing number of union members question whether the tariffs will lead to more manufacturing jobs, better wages and working conditions. At the Bull Moose Tube steel piping factory in Georgia, 56 United Steel Workers union members have been barred from their workplace for more than six weeks. The union had rejected a new agreement with the company. The proposed deal offered a small wage increase, but asked workers to pay a lot more for their healthcare. “I’m going backwards instead of forwards,” said steelworker David Horton. He has been off the job without pay since August 22. Employees have been demonstrating near the factory while the company brought in non-union workers during the labor dispute. A USW strike may seem unusual given all the help the industry has received after Trump ordered 25 percent tariffs on imported steel and aluminum. The new taxes took effect last March in what the president called a national security measure. Since then, metal prices have increased by 30 percent and profits for American steel companies have jumped. Yet Bull Moose Tube workers were unhappy with the company's offer and decided to call a strike. Union members at two other companies have also voted to strike:15,000 workers at factories owned by ArcelorMittal and 16,000 at U.S. Steel. 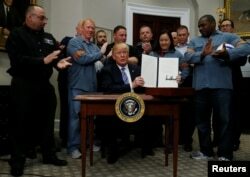 U.S. President Donald Trump is after signing a proclamation to establish tariffs on imports of steel and aluminum at the White House in Washington, March 8, 2018. Union workers say they are being asked to accept deep cuts in pay and benefits after years of asking for nothing. They note that since the 1970s, the U.S. steel industry has been weak. This is not what they had hoped would come from the tariffs. Joey Casey is the president of the United Steelworkers’ local office at Bull Moose Tube. Casey told VOA, “I don’t think that President Trump intended to increase the value of steel and increase the steel production in the country for companies to use it like they’re using it on us." "I think it’s an abuse,” he added. But U.S. steel companies may be slow to increase worker wages because business leaders see tariffs as measures that will one day be cancelled. Ian Murry is a labor expert with the Competitive Enterprise Institute. “In the long run, the jobs that are created or saved are unsustainable. And eventually, if the tariffs go away, that industry is going to suffer very, very badly," he warned. Major labor groups have close ties with the Democratic Party, but they quietly supported the president’s tariffs in the beginning. Trump is a member of the Republican Party. USW had asked the Trump administration to leave Canadian steel free from tariffs, partly because the union has more than 225,000 Canadian members. 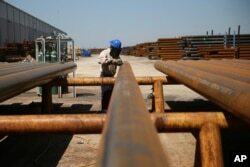 Tariffs went into effect on Canadian steel at the beginning of June. Now, it is harder to understand how the unions feel about tariffs. VOA reached out to the leadership of USW and several other unions. None agreed to answer questions. FILE - Jose Mata grinds a steel pipe at the Borusan Mannesmann plant in Baytown, Texas, April 23, 2018. Union leaders say tariffs should be combined with other measures, such as rebuilding roads and bridges, and providing training programs to workers. “We think that at times tariffs can be an appropriate tool,” said Josh Nassar, the United Auto Workers legislative director. But he added that tariffs are not an answer in and of themselves. He was speaking last month to the U.S. Senate Finance Committee about the effect of tariffs on car manufacturers. Labor unions are against most of the Trump administration’s economic policies. They oppose tax cuts for the rich to easing rules that protect worker rights and safety. “They are deeply critical of the Trump agenda,” noted Leon Fink, a labor historian. The labor movement also opposes Trump’s effort to ease environmental rules and what they say are his administration’s anti-immigrant policies. But some union members give the president credit for trying. “It was nice to see the president step in and try to do something for the industry,” said Casey, leader of the striking workers at the Bull Moose Tube plant. VOA’s Brian Padden reported this story. Susan Shand adapted his report for Learning English. The editor was George Grow.